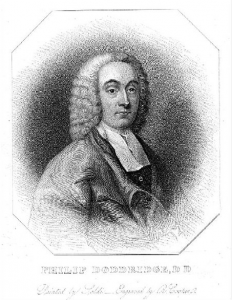 Philip Doddridge (1702-1751), the last of twenty children, was from a long line of British nonconformists. Doddridge was a pastor and educator and also a prolific writer, writing books and over 400 hymns, the best known being O Happy Day, and Grace! Tis a Charming Sound. This, his best known work, Charles Spurgeon often referred to as “that holy book.” It is dedicated to Isaac Watts, and it was influential in the conversion of William Wilberforce. My copy is a reprint from the collections of the University of Michigan library and so is a reproduction of the original publication. Of all the books I have reviewed on the Christian Life this year, this is no doubt the most confronting and challenging. In 30 chapters and 323 pages, Doddridge takes the reader, in a very conversational tone, from conviction as an unbeliever to dying as one who walks closely with God. Step by step Doddridge pointedly places the Christian life before the reader without apology or compromise. Almost a third of the book is concerned with explaining the biblical view of sin and repentance in a way that would be unappealing and tiring to the modern evangelical. Then conversion and the proof of it are labored over in the next third of the book, with the praises and blessing of the true believer making up the last third. The final two chapters on the death of the godly believer are the best thing I’ve ever read on the subject. This book is not for nominal Christians. Read it at your own risk of being thoroughly convicted.